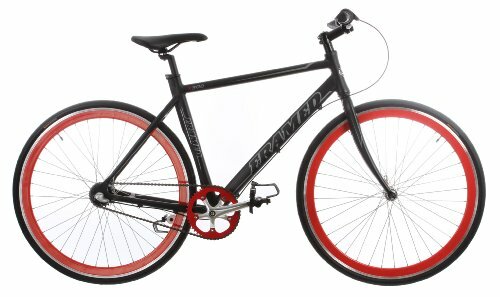 Framed has had a rich legacy of producing top-quality commuter bikes with simplistic features and the X300 bike is another quality offering from the impressive product line of Framed. This bike combines the speed of a road bike with the comfort and reliability of a commuter bike. It comes equipped with a 6061 Alloy frameset which makes it light as well as robust. Shimano Nexus 3-speed rear hub and Coaster brakes used in this bike have a proven record of delivering excellence. The ride quality offered by this bike is extremely smooth and delectable and riding it is immense fun. This bike is ideal if you are looking for a simple bike which offers to you speed and performance coupled with durability, style and comfort. The price point at which this bike is available will certainly catch your attention and looking at the set of components used in this bike along with the quality delivered by this bike, it is quite a bargain. The Framed X300 3-speed comes equipped with a Framed Alloy 6061 Track Frameset; 1-1/8’’ 6061 Alloy Fork; Press-in 1 1/8th Headset; Framed Steel Low Rise Handlebar (500 millimetre/30 millimetre rise); Framed Alloy A-head Stem (4-bolt, Extension : 90 millimetre); Framed Silver Series Saddle; Framed Straight Alloy Seatpost; Framed 175 millimetre Alloy Crankset; Framed 46t Steel Chainring; Framed Deep V 700C Alloy 36H Rims; Alloy Sealed Front Hub; Shimano Nexus 3-speed Rear Hub; Coaster Brake; Shimano Revo Grip Shifter; Framed Ergo Grips; Kenda K-193 Kwest K-Shield (700x 28) Puncture-free Front and Rear Tires; Framed Sealed Bottom Bracket and Framed Silver Series Saddle. If you are looking for a budget commuter bike which offers you comfort of riding and reliability you can certainly consider this one as one of your choice. This bike not only delivers a smooth and enjoyable ride but also has the ability to go fast which adds a sporty feel to it. Its light but sturdy aluminium frame makes it extremely easy to handle. The bike offers a pretty comfortable ride position. It comes with Kenda K193 puncture resistant tires which offer durability and a hassle free ride experience. The bike does not ship fully assembled and there are no printed instructions provided on how to assemble the bike. If you have not assembled a bike before, it is best to take this one to your local bike shop. You might also want to have the saddle replaced as it is not as comfortable as you would have liked it to be. The chain of this bike has a tendency of making a squeaking noise. Overall, this bike delivers a power-packed performance coupled with speed, durability and comfort of riding at an extremely reasonable price point. The bike looks stunning and will certainly impress you with its slick and stylish looks.